Oh my... Twitter's US Head of Ad Sales just confirmed that their 'data' isn't worth that much. For years, we have been told that the social networks are worth billions of dollars exactly because they have so much data about us. They say that they can use their platforms, the logged-in user profiling and all those other factors to target people with advertising. And, for years, we have been told that this was what made them special, and that without this treasure trove of data the advertising wouldn't work as well. The problem is that, in most cases, the returns haven't lived up to this promise. We don't really see the conversions we would expect from this amazing data. Instead, most social advertising campaigns seem to perform no better than anywhere else, with the only real difference being the format. Obviously an in-stream ad that matches the other posts (native format) will perform better than a display advertising (banner format). And Twitter's US Head of Ad Sales have just confirmed this. In an interview with Digiday, he revealed how they are now running ad campaigns to people coming from outside of Twitter (aka not logged in), and that these ads perform the same as Twitter's internal ads. Think about this for a moment. This means that Twitter's massive trove of profiling data isn't worth anything extra. The ads that are served to these visitors, mostly target by interest, based on the type of tweet they are viewing. For instance, during the Super Bowl, Marshawn Lynch retired from football and announced it with a tweet. We do have that understanding of where people are coming from. If they click on a Marshawn Lynch tweet, then we'll make some assumptions ... and we'll develop a profile to serve the most relevant ad possible. I have written about this many times before, but lately in "The Uncertain Future of Advertising". In this article, I talk about how targeting who people are is mostly crap compared to what people are doing. And Twitter now proves this by saying that ads for non-logged in people perform the same as for those who are logged in. They prove that the real metric for advertising is intent based to a far greater extend than being personality based. Targeting is one of the biggest demands from advertisers, and the larger the logged-in user base, the better a platform knows its users. No. Not according to Twitter. Twitter just said that it doesn't matter if they know their users or not. As long as they know what they are doing, they can deliver just as effective ads. Who people are don't matter that much. I have seen this for years as a media analyst. All the platforms keep talking how valuable they are because of how much data they have about you and how they can use that to target us. But when we look at the advertising results, the ad performance hasn't gone up. We can provide the same level of deliverable results [with interest based ads] that we can with logged-in users [profiling based ads]. Doesn't that make you think? Mind you, I'm not saying that targeting isn't important. It obviously is. What I am saying is that we need to rethink how we are targeting people. The way we are doing it now has proven to not work very well, despite what all the ad networks say. We see this not just on Twitter, but everywhere. And the solution seems very straight forward. We need to refocus how we target people based on each person's actual intent at each specific moment. It doesn't matter, for instance, if a person is profiled to love gardens if he is currently reading about mountain bikes. The intent of reading about mountain bikes outranks the profiling data by a wide margin. This is the same that Twitter is now saying. It doesn't matter who you are if they know you are reading a Tweet about the Super Bowl. The intent of what people are doing at that moment outranks whatever it is they are doing in general. In comparison, below is what ads look like when you are just focusing on who people are. I have shown this example before. 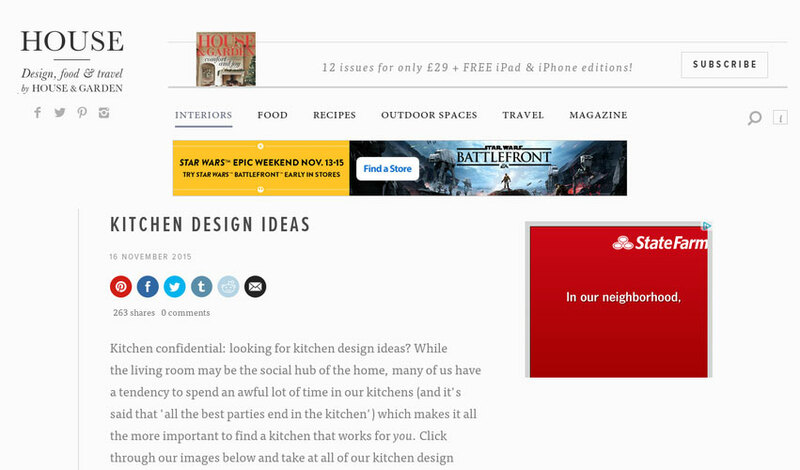 I visited House & Gardens to read about kitchen ideas, and the ad displayed to me was about a Star Wars game. I do love Star Wars, and I do play computer games, so yes, in terms of personality, the ad matches my person. But, my intent is focused on kitchen ideas. I don't care about this game at that moment. This is why profile based advertising perform no better than other types of ad targeting. The profile is irrelevant unless it matches the intent. Or worse, it's an annoying distraction that people will use an ad-blocker to get rid of.